Leading Wholesale Trader of dished ends from Thane. 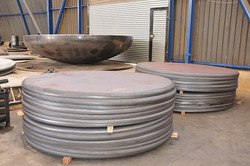 We are counted amongst trusted names in manufacturing & supplying an exclusive range of Dish End. These are fabricated by our team of experts using high grade material. Our offered range of Dish End can be availed from us at very economical prices. 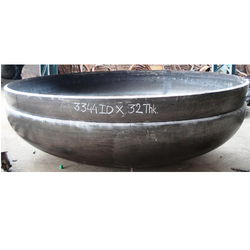 Material Stainless Steel, Carbon Steel, Alloy Steel, Cladded Plates, and Platinum Plates etc. We manufacture Dished-end of thickness from 6mm to 63mm & sizes ranging from 100mm ID to 5500mm ID of a material such as Stainless Steel, Carbon Steel, Alloy Steel, Cladded Plates, and Platinum Plates etc. In case of Crown & Petal Dished-End, Complete “V” preparation & mock up assembly is carried out. Looking for DISHED ENDS ?